The constant downpour of rain begins to flood the earth. Migrants build dikes around their tents to protect themselves from flooding. Some try to get monetary assistance from the relief offices, but have not lived in the state long enough to receive aid. The flood is a hardship of biblical scale. Unlike human cruelty, which the migrants can overcome, the power of nature is impossible for humans to resist. Migrants begin to succumb to illness, and the rains force them to beg, lie, and steal. Police strengthen their forces, and townspeople’s loathing for the Okies grows. It takes a natural disaster, and not mere human cruelty, to compromise the migrants’ morals. The townspeople just see their own prejudices confirmed in the Okie's misery. The Okies’ deeper desperation also makes them angrier. The migrant women watch their men to see if their wills have been broken. The women are comforted to notice that when the men are gathered together, they no longer seem fearful, but are instead filled with wrath. This scene recalls the beginning of the book. Like the Oklahoma drought, the flood fails to break the men’s wills. It is the men’s wrath that allows them to persevere. After the rains abate, small shoots of greenery begin to emerge from the earth. The budding plants illustrate that hope springs eternal, and that growth and triumph can come from despair and terrible circumstances. Sobel, Ben. "The Grapes of Wrath Chapter 29." LitCharts. LitCharts LLC, 17 Sep 2013. Web. 21 Mar 2019. Sobel, Ben. "The Grapes of Wrath Chapter 29." LitCharts LLC, September 17, 2013. 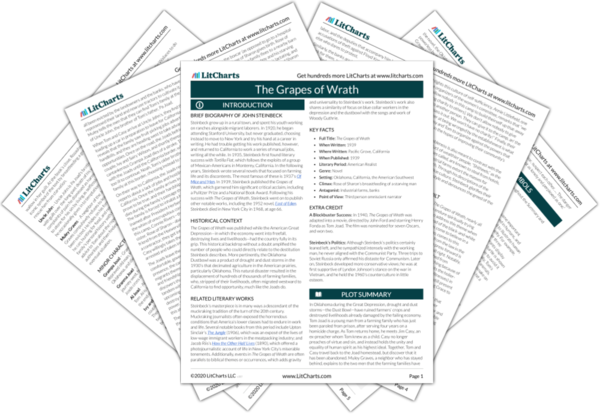 Retrieved March 21, 2019. https://www.litcharts.com/lit/the-grapes-of-wrath/chapter-29.